I can’t even tell you how much stories like this piss me off. According to the Daily Pilot, a Costa Mesa rider suffered major injuries when she was hit by a car before sunrise Monday morning. The driver was headed east on Bay Street when he turned right on Newport Blvd and heard a loud noise, then found 44-year old Michelle Lounsbury trapped underneath his car. In other words, he had no idea she was anywhere around when he made his turn. Now, it’s always possible that it could have been her fault, at least in part. She may or may not have been using lights in the early morning darkness. She may or may not have been properly positioned on the roadway, and riding in safe manner. The story doesn’t offer enough information to know what really happened. On the other hand, if she’s close enough to run over, she should be close enough to see. Every driver has an obligation to be aware of anyone and everyone else on the roadway. If someone is capable of being seen, it’s the driver’s obligation to see them — especially before making a turn. Too often, that doesn’t happen. Too often, someone gets hurt as a result. Or worse. And too often, police accept “I just didn’t see her” as the universal Get Out of Jail Free card, as the last line of that story may suggest. Best wishes to Michelle Lounsbury for a full and fast recovery. 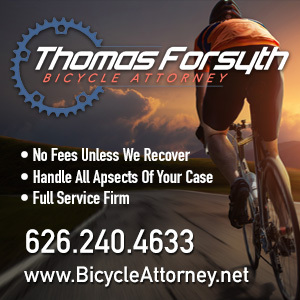 I’ve gotten several reports of other serious SoCal bike collisions that have left riders badly injured over the past few days, so far without any follow-up. In cases like this, no news is usually good news. So let’s hope that continues to be the case. But some prayers or good thoughts might be in order if you’re so inclined. After Mayor Garcetti lets LADOT chief Jaime De La Vega go, the Times questions whether NYDOT Commissioner Janette Sadik-Khan might be the right replacement. Word is Chicago’s exceptional DOT Commissioner Gabe Klein is about to become available, as well. That’s a hint, Mr. Mayor. 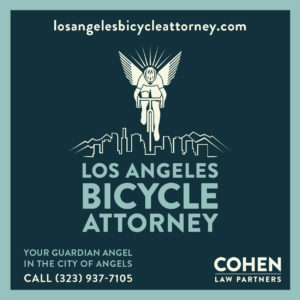 Meanwhile, the LACBC’s Executive Director Jen Klausner offers an OpEd in response to a Times opinion piece claiming LA will never be a bike-friendly place. According to Klausner, our streets aren’t safe enough, but we’re getting there. 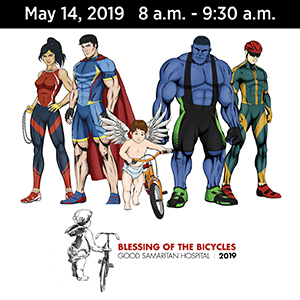 Thanks to John Stesney for sending word of an upcoming bike race at the StubHub Center. Since he did a pretty good job of describing it, I’ll let him tell the story. 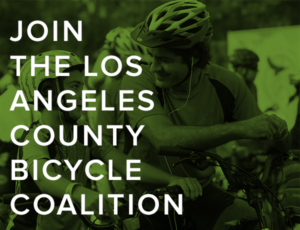 The Los Angeles County Bicycle Coalition calls on the city to move beyond low-hanging fruit in building bikeways, and sponsors a petition calling for cycletracks in LA. Cracks begin to show in official support for the deadly, highway speed proposal to remake the Hyperion-Glendale bridge complex, as CD13 Councilmember Mitch O’Farrell promises mores study; meanwhile, the LACBC calls for action. A new bike corral opens in Atwater. You’re invited to ride in the NELA Holiday Parade December 1st. Streetsblog says the new 7th Street bike lanes are looking good. A look at the Dia de los Muertos altar to fallen cyclists in Grand Park over the weekend; thanks to Joni for the link. The San Diego Bicycle Coalition needs your help to help create a more livable Coastal Rail Trail. Cyclelicious looks at the ideology of bicycling. It looks like the beavers are back to destroy Bakersfield’s Kern River bike path. Boyonabike enjoys a car-free Santa Barbara weekend, along with several thousand other Open Streets participants. Cyclists say the recent fix for Caltrans’ Highway 1 chip sealing disaster has been a failure. San Luis Obispo is getting a $64 million bike plan. Turns out electric cars are just as deadly as the other kind — especially if the driver is asleep behind the wheel. A 12-year old Berkeley bicyclist rides the entire Left Coast to draw attention to climate change. It’s that time of year to focus on being seen after dark. How to work with police for smarter enforcement. How Complete Streets became hip. A new bike alarm uses a sort of crowdsourcing to recover your stolen bike. A look at bicycle insurance and the nation’s most dangerous states for riding. The battle to make Yuma bike friendly. The “six kids and no car” mom has her bakfiets stolen. Bike Portland offers an ode to bicycle butts. Portland tests solar powered lights to call attention to a bike path; reviews are mixed. Mad City offers cyclists a choice of bike path or bike lane along the same route. Building right hooks by design in Chicago. The Chicago Reader offers an in-depth look at a fallen cyclist, the driver who killed him and our lenient drunk driving laws. A Columbus OH reporter and bike blogger is critically injured in a cycling collision; the driver is charged with his second DUI in two weeks — but amazingly, it’s just a misdemeanor offense. Seriously? A New Hampshire hit-and-run driver ran over and killed her former boyfriend; just a coincidence, right? A Boston cyclist has a dangerously close encounter with a spoiled motorist and her driving dog. Ridership is up for New York’s Citi Bike bike share program, which isn’t the death trap critics had feared, or perhaps, hoped for, in some cases; but no jokes about riding Brooke Shields, please. Delaware no longer says Share the Road. Canadian pediatricians call for mandatory helmet laws for everyone, perhaps hoping to reduce the rate of cycling, as well as injuries. Is Toronto’s bike-hating mayor a crack-smoking serial drunk driver? If you build it, they really will come; study shows investing in bikeways results in increased journeys while reducing motor trips. The rate of cyclists killed or injured on London streets went up 18% last year. Bristol England prepares to go Dutch. Indian cyclists are getting crushed — sometimes literally — in the nation’s rush to prosperity. An Aussie site asks if the media helps whip up anti-cyclist rage; well, duh. Finally, how to survive the coming Zombie Apocalypse through bike share, including advice that wearing a helmet makes it harder for zombies to feast on your brain. On the other hand, how you ride your bike could offer prospective employers insight into yours. Stolen bakfiets is nothing. We had a local guy here in San Jose who had his commercial bike taxi stolen – the big, three wheelers manufactured in Broomfield CO with a fiberglass body and covered in advertising and lights. It hasn’t been recovered yet after six weeks. The link in the Oregonian article about solar powered bike lane markers takes you to Geveko’s Swedish language page which probably looked like Danish to the reporter. This link should take you to the page about the tech in English with a video.